Abu Bakar, A. H., Koay, Y. S., Ching, Y. C., Abdullah, L. C., Choong, T. S. Y., Alkhatib, M., Mobarekeh, M. N., and Mohd Zahri, N. A. (2016). "Removal of fluoride using quaternized palm kernel shell as adsorbents: Equilibrium isotherms and kinetics studies," BioRes. 11(2), 4485-4511. Palm kernel shell (PKS) core fibers, an agricultural waste, were chemically modified using N-(3-chloro-2-hydroxypropyl) trimethylammonium chloride (CHMAC) as a quaternizing agent. The potential of quaternized palm kernel shell (QPKS) as an adsorbent for fluoride in an aqueous solution was then studied. The quaternized palm kernel shell (QPKS) core fibers were characterized using Fourier transform infrared spectroscopy (FTIR) and a scanning electron microscope (SEM). The effect of various factors on the fluoride sequestration was also investigated. The results showed that with an increase in the adsorbent amount and contact time, the efficiency of fluoride removal was improved. 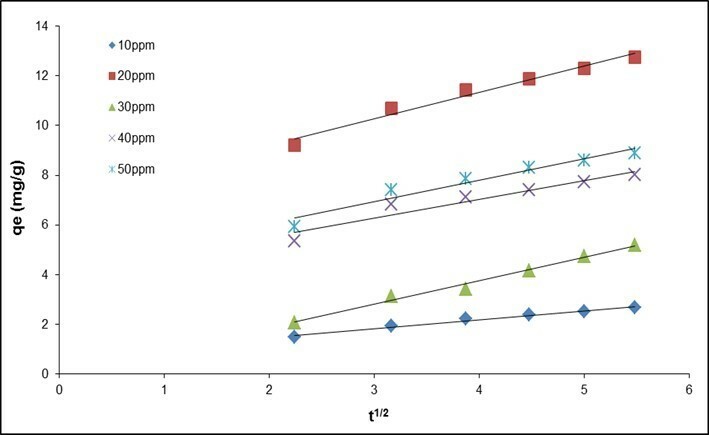 The maximum fluoride uptake was obtained at pH 3 and a contact time of 4 h. The adsorption behavior was further investigated using equilibrium isotherms and kinetics studies. The results from these studies fit well into Freundlich, Redlich-Peterson, and Sips isotherm’s with a coefficient of determination (R2) of 0.9716. The maximum fluoride removal was 63%. For kinetics studies, the pseudo-second order was the best fit for fluoride, with an R2 of 0.999. These results suggest that QPKS has the potential to serve as a low-cost adsorbent for fluoride removal from aqueous solutions. Fluoride, a salt of the element fluorine, occurs primarily as sellaite (MgF2), fluorspar (CaF2), cryolite (Na3AlF6), and fluorapatite [3Ca3(PO4)2 Ca(F,Cl2)]. It is an essential constituent for both humans and animals, depending on the total amount ingested or its concentration in drinking water. The presence of fluorine in drinking water, within permissible limits of 0.5 to 1.0 mg/L, is beneficial for the production and maintenance of healthy bones and teeth, while excessive intake of fluoride causes dental or skeletal fluorosis, which is a chronic disease that manifests through the mottling of teeth in mild cases, and even the softening of bones and neurological damage in severe cases (Lounici et al. 1997; Srimurali et al. 1998; Hichour et al. 1999; Wang and Reardon 2001). The difference between desirable doses and toxic doses of fluoride is poorly defined, and fluoride may therefore be considered an essential mineral with a narrow margin of safety (WHO 1984). Table 1 shows the effect of prolonged exposure at high fluoride concentrations as dental fluorosis progresses to skeletal fluorosis (Dissanayake 1991). High fluoride level wastewater is produced every day by industries using hydrofluoric acid as a cleaning agent, such as the semiconductor, solar cell, and metal manufacturing industries, or as a reactant or catalyst in the plastics, pharmaceutical, petroleum refining, and refrigeration industries. Untreated high-fluoride level wastewater is one of the key contributors to ground water and surface water pollution (Gupta and Suhas 2009; Malakootian et al. 2011). Thus, the problems associated with excess fluoride in water bodies can be highly endemic and widespread in many countries. Fluoride removal technology has been a subject of interest among researchers for many years. Table 2 shows a comparison between various fluoride wastewater treatment methods (Bhatnagar et al. 2011). Most treatment methods impose high costs either in installing or maintaining the system. Even though some methods like reverse osmosis are simple and have low operating costs, there is still some secondary pollution generated. As such, the process used to dispose of the secondary pollution will also be costly. In contrast, the adsorption method has been reported as one of the most effective, economical, and environmentaly friendly of the various deﬂuoridation techniques (Kagne et al. 2008; Deng et al. 2011; Srivastav et al. 2013). The advantage of adsorption is its simplicity in design and operation. However, the selection of adsorbents also plays an important role in the adsorption process. Malaysia accounts for 39% of the world’s palm oil production and is the world’s second biggest palm oil exporter, after Indonesia. Malaysia planted a total area of 5.03 million hectares of oil palms in June 2012 (MPOB 2012a), and produced 17 million tons of palm oil from January 2012 to November 2012 (MPOB 2012b). The process of crude palm oil extraction from fresh fruit bunches produces few types of agricultural waste, namely empty fruit bunch (EFB), palm kernel shell (PKS), fiber, and palm oil mill effluent (POME). The estimated percentage of palm oil mill waste produced is 14.6% of EFB, 10.4% PKS, 15.4% of fiber, and 6.3% POME on the basis of dry weight of fresh fruit bunch (FFB) (Yusoff 2006). Ng et al. (2012) reported that in the year 2010, Malaysia produced a total of 86.90 million tons of palm oil biomass and 5.2 million tons of palm kernel shell (PKS). PKS is a more suitable adsorbent material than other palm oil waste because of its high mechanical strength, porous surface, chemical stability, variable surface functional groups, and insolubility in water. 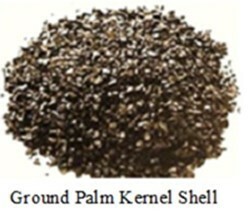 Figure 1 shows images of palm kernel shell. 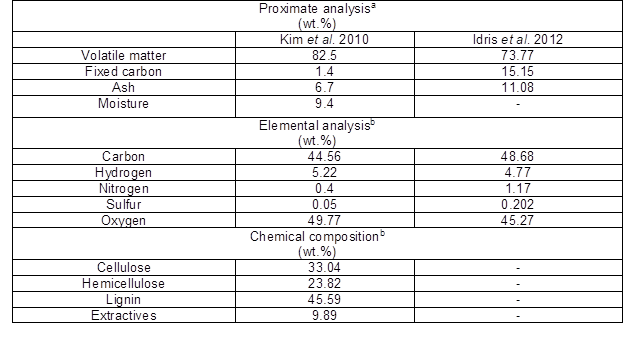 The proximate chemical composition and elemental analysis for PKS are shown in Table 3, as reported by Idris et al. (2012) and Kim et al. (2010). Quaternization is a surface chemical treatment that adds R-NR’3+ groups (where R represents cellulose, hemicellulose, or lignin structures and R’ represents an alkyl group) onto the surface of lignocellulosic fibers via epoxy substitution to increase its affinity toward anionic substances by promoting ion-exchange adsorption (Malakootian et al. 2011; Bhatnagar et al. 2011). Cellulose is a straight-chain natural polymer that consists of a β-D-glucopyranose monomer and is covalently linked by a β-1,4-glycocidic bond. A molecule of cellulose has many hydroxyl groups attached, but reactions only happen to the hydroxyl group at C-6 conformations as a result of steric hindrance (Perez and Samain 2010). There are many quaternizing agents that can be used, depending on the reaction mechanism desired. The quaternizing agents most used in research are trimethylamine and N-(3-chloro-2-hydroxypropyl) trimethylammonium chloride (CHMAC). Quarternizing reactions using triethylamine as the quaternizing agent require pyridine as a catalyst and N,N-dimethylformamide (DMF) as a solvent, both of which are carcinogenic and expensive. Therefore, CHMAC is a preferred quaternizing agent, as only sodium hydroxide is needed in the reaction, which is a relatively cheap and safe chemical to use (Marshall and Wartelle 2004; de Lima et al. 2012). There are three reaction steps in a quaternization reaction; the interaction between cellulose and sodium hydroxide, epoxy formation from CHMAC, and the reaction between epoxide and the hydroxyl group of cellulose to produce ether, as shown in Fig. 2 (de Lima et al. 2012). Quaternized lignocellulosic fiber shows an increase in adsorption capacity and affinity toward anionic substrates as the quaternization treatment increases the porosity, surface area, and chelating functional groups. 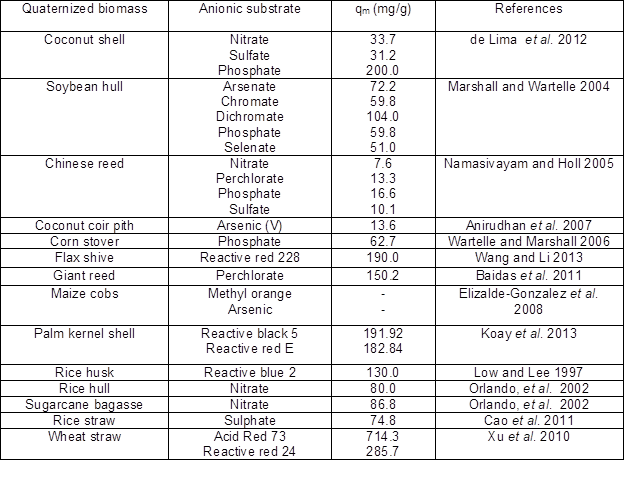 A summary of research conducted using quaternized lignocellulosic fiber as an adsorbent in the removal of anionic substrates is shown in Table 4 (Low and Lee 1997; Orlando et al. 2002; Marshall and Wartelle 2004; Namasivayam and Holl 2005; Wartelle and Marshall 2006; Anirudhan et al. 2007; Elizalde-Gonzalez et al. 2008; Xu et al. 2010; Baidas et al. 2011; Cao et al. 2011; de Lima et al. 2012; Wang and Li 2013; Koay et al. 2013). However, there is no study that reports on the removal of fluoride using quaternized lignocellulosic fibers. The objective of this paper was to synthesize quaternized palm kernel shell (QPKS) core fibers adsorbent using the quaternization process and N-(3-chloro-2-hydroxypropyl) trimethylammonium chloride (CHMAC) as the quaternization agent. The parameters investigated in this study included the effects of pH, contact time, sorbent dose, initial fluoride concentration, adsorption isotherm, and kinetics on the removal of fluoride in aqueous solution using QPKS core fibers. 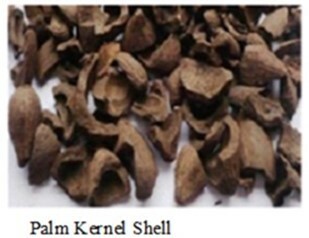 Raw palm kernel shell waste from crude palm oil production was obtained from the Ulu Langat palm oil mill, Selangor, Malaysia. The PKS was washed with hot water followed by acetone to remove oil, and then dried under the sun for three days. Then, the raw PKS was ground and sieved to a size between 1 and 0.25 mm. The method for quaternization of PKS has been described by Koay et al. (2013). Granular PKS was mercerized with sodium hydroxide, NaOH (Merck, 98% purity) of 20 wt.%, 40 wt.%, and 60 wt.% respectively for 10 h to determine the optimum NaOH concentration. Mercerized PKS was rinsed with distilled water and dried at 60 °C for 24 h.
The ratio of the two reactants, namely NaOH and N-(3-chloro-2-hydroxypropyl) trimethylammonium chloride, CHMAC (Sigma, obtained with 60% purity) to PKS was stoichiometrically calculated from the quaternization reaction (Fig. 2) to yield the optimum quaternization reaction. In this reaction, CHMAC served as the limiting reactant. Therefore, according to the calculation, each gram of PKS reacted with 37 mol of NaOH and 35 mol of CHMAC. The wt./wt. ratio of quaternization reactants, specifically NaOH, CHMAC, and water, was 1.5: 4: 2.5, respectively, per gram of mercerized PKS. The reaction mixture was kept in a sealed container at room temperature for 24 h. Afterwards, the fiber was washed with 0.2% acetic acid solution to stop the reaction and then further washed with distilled water until a neutral pH was achieved. QPKS was dried at 60 °C for 48 h and kept in a desiccator. The QPKS was characterized using carbon, hydrogen, and nitrogen elemental analysis (CHN analysis), a Fourier transform-infrared spectrometer (FT-IR), scanning electron microscope (SEM), energy dispersive X-ray analysis (EDX), Brunauer, Emmett, and Teller analysis (BET), thermogravimetric analysis (TGA), and X-ray diffraction (XRD). The point zero charge, surface chemistry, and chemical composition of QPKS were also determined. The CHN analysis was conducted to determine the percentage of carbon, hydrogen, and nitrogen contained in the sample. Approximately 0.5 mg of sample was weighed using a CHN C-31 Microbalance. Analysis of the sample was done using a LECO CHNS-932 (USA) spectrometer. Infrared (IR) spectra were recorded by a Perkin Elmer 1750X, FT-IR (Perkin Elmer, USA). The sampling technique used attenuated total reflectance (ATR) for all samples. All spectra were plotted as the percentage of transmittance against wave number (cm-1) at a range of 400 to 4000 cm-1 at room temperature. Functional groups of samples were determined from the FTIR spectra. A Hitachi S-3400N SEM equipped with an EDX attachment (Hitachi, Japan) was operated at 20 to 30 kV. Samples were coated with a thin layer of Au/Pd prior to analysis. The scanning electron photographs were recorded at magnifications of 1000X to 5000X, depending on the nature of the sample. The BET method was used to analyze the surface area of samples. The BET surface area analyzer used was an AutoSorb-1 Quantachrome (Quantachrome Instruments, UK). Pore size distribution, average pore size, and pore volume of the samples were determined using the Barrett, Johner, and Halenda (BJH) equation. 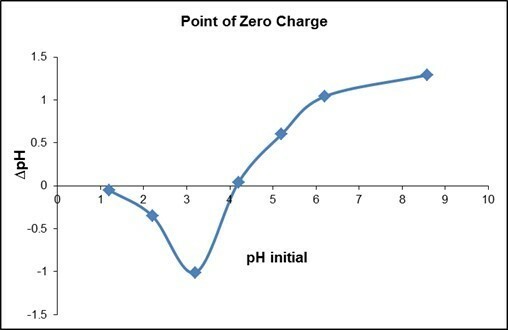 The point zero charge (pHpzc), or the isoelectric point of the samples, was determined by placing 0.1 g of QPKS into 100 mL of 0.01 M NaNO3 (Acros, 99% purity) solution; pH was adjusted from 2 to 9 by adding 0.1 N HCl (Acros, 99% purity) or 0.1 N NaOH (Merck, 98% purity). The flasks were sealed and shaken for three days at room temperature. The pH of each solution before and after shaking was measured using a pH meter (B729 Eutect-Singapore) (Arockiaraj et al. 2014). Surface chemistry was acquired using the Boehm titration method (Boehm 1994) with the fundamental principle of neutralizing various surface functional groups by acids or bases of different strengths. One gram of sorbent was placed into a 100-mL flask containing 50 mL of 0.1 N Na2CO3 (Acros, 99% purity), NaHCO3 (Acros, 99% purity), NaOH, or HCl. The flasks were sealed and shaken for three days; then, the solution was filtered using 0.45-μm filter paper and 10 mL of the filtrate was pipetted. The acidic solution was titrated with 0.1 N NaOH, and the resulting basic solution was titrated with 0.1 N HCl to determine the remaining acid or base. A stock solution of fluoride was prepared by dissolving sodium fluoride (MERCK, Germany) in 1 L of double distilled water. The required concentration of fluoride solution was prepared via the serial dilution of 100 mg/L fluoride stock solution. All the experiments were completed in batch systems using 250-mL Erlenmeyer flasks. All flasks were sealed properly to prevent leakage and evaporation. All samples were shaken mechanically using a digital orbital shaker (Wise Shake SHO-2D, Korea) at 150 rpm (± 2 rpm) and 25 °C (+ 2 °C). Fluoride ions were measured as per standard methods using a portable fluoride meter (Hach, USA) working at a fixed wavelength of 570 nm. The adsorption performance of QPKS was characterized using fluoride uptake. The adsorption parameters studied were initial pH, contact time, sorbent dose, and initial fluoride concentration. After adsorption, the waste adsorbent can be used as renewable burning material for energy production or incineration. A pH meter (B729 Eutect, Singapore) was calibrated using buffer solutions of pH 4.0, 7.0, and 10.0 to prevent error. The initial pH of 5 mg/L solutions was adjusted to 1, 2, 3, 4, 5, 6 and 7. After this, 1 g/L of QPKS was added to each flask and they were shaken for 1 h.
The effect of QPKS dosage was investigated by running batch experiments with various amounts of QPKS (1, 2, 4, 8, or 10 g/L) added to 100 mL of 5 mg/L fluoride solutions. The pH was adjusted to the optimum pH and the flasks were shaken for 4 h, by which time the solutions had reached equilibrium. 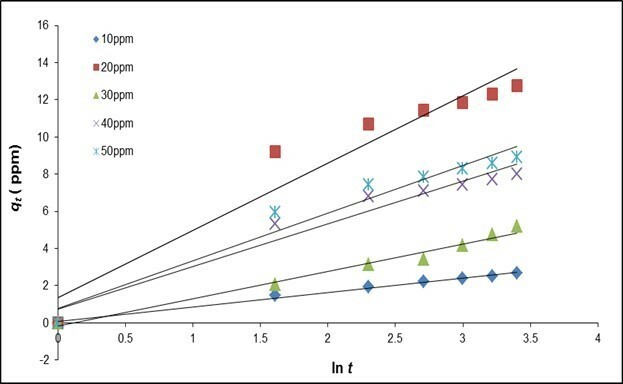 The effect of initial concentration on QPKS adsorption was studied using 100 mL of fluoride solution with initial fluoride concentrations of 5, 10, 20, 30, 40, or 50 mg/L in a series of 250-mL Erlenmeyer flasks (Pyrex, England). A total of 1 g/L of QPKS was added to each flask, which was sealed properly. The samples were shaken for 4 h.
The textural structure of QPKS was observed with SEM images. Figure 3(b) shows that QPKS had more macropores, which favors the adsorption of larger molecules, as compared with PKS (Fig. 3(a)). The QPKS has heterogeneous pore arrangement. After quaternization, the surface of the fiber turned smoother because of the dissolution of impurities and lignin under alkaline solution in NaOH. The quantitative data on QPKS pore size was determined using BET analysis in the subsequent part. As illustrated in Table 5, the average pore diameter of PKS was 2.2 nm, so they can be classified as mesopores. After treatment, QPKS had an average pore diameter of 112.6 nm, classified as macropores. 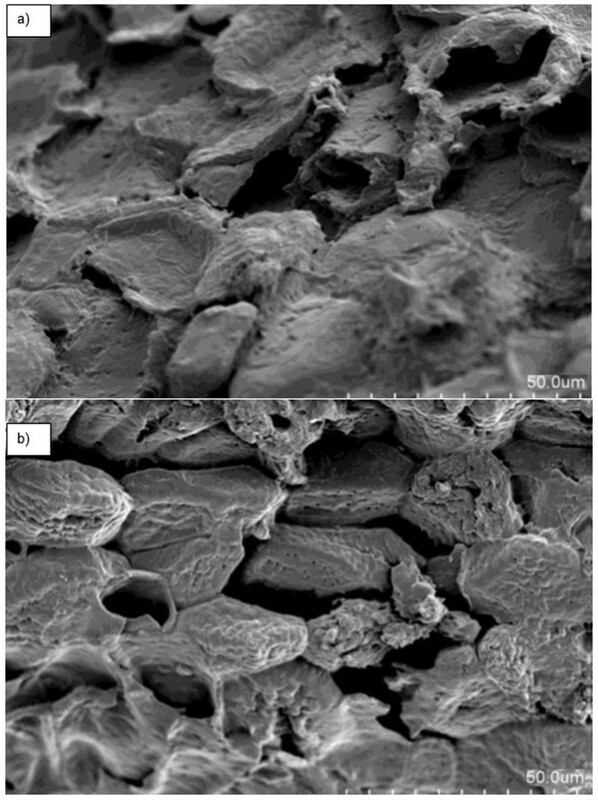 Enlargement of the pore size was due to the dissolution of lignin and hemicellulose in the NaOH solution during the pre-treatment mercerization process. Results from the CHN elemental analysis tabulated in Table 6 confirmed that the quaternization reaction on PKS was successful. The nitrogen percentage increased from 0.24% to 0.98% after quaternization. According to the CHN analysis, the percentage of carbon in QPKS decreased by 2.16% after treatment. This slight decrease was caused by degradation of lignin, hemicellulose, impurities, and extracts during mercerization and cauterization, with both processes under basic conditions. Energy-dispersive X-ray analysis is a surface elemental analysis used in conjunction with SEM and serves the same purpose as a CHN analysis. However, EDX only detects the surface elements, while CHN analysis detects elements throughout the entire substrate. The results for PKS and QPKS are listed in Table 7, and the spectra are shown in Fig. 4. A high percentage of nitrogen was detected in QPKS, but was not detected in PKS. Hence, this analysis again verifies that the quaternary ammonia group (NR4+) reacted on QPKS, resulting in a successful synthesis. Moreover, the percentage of nitrogen in the QPKS sample detected using EDX (13.98%) was higher than results obtained from the CHN analyzer (0.98%). It was therefore concluded that the NR4+ group primarily reacted with the surface of the fiber. 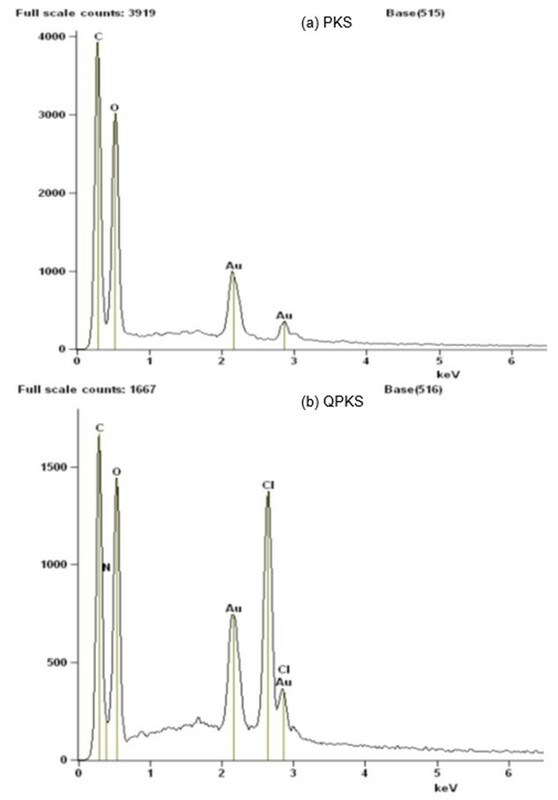 Figure 5 shows FTIR spectra of PKS and QPKS. A weak peak at 935 cm-1 in the QPKS spectrum, which is not present in the PKS spectrum, was attributed to C-N stretching, indicating that the NR4+ group was successfully quaternized in QPKS (Hebeish et al. 2010). Furthermore, peaks at 1462 and 1420 cm-1 with nearly equal intensities, which can be assigned to C-H stretching of the tert-butyl group, are evidence of the quaternary ammonia group reacting with QPKS. The FTIR spectra of PKS and QPKS show O-H stretching at 3353 and 3297 cm-1, and C-H stretching at 2923 and 2902 cm-1, respectively. The C-O stretch mode in C-O-C cellulose linkages appeared at 1030 and 1033 cm-1, respectively, for PKS and QPKS. The PKS spectrum shows weak combination bands between 2500 and 2000 cm-1 that are associated with an aromatic ring structure. 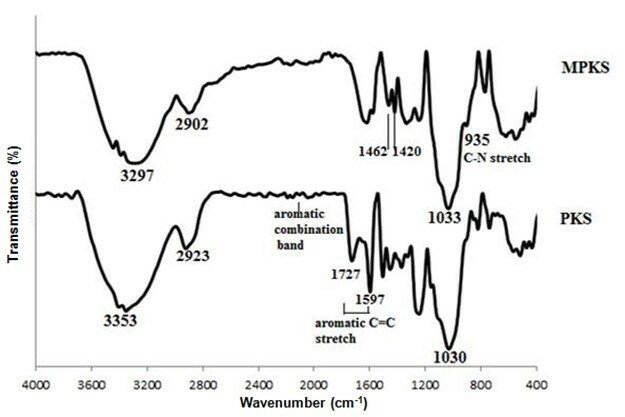 Furthermore, peaks at 1727 and 1597 cm-1 on the PKS spectrum can be attributed to aromatic C=C stretching (Pavia et al. 2009). From Fig. 6, the pHpzc was determined at a pH of 4.2, where ΔpH = 0. pH values below the pHpzc resulted in a net positive surface charge of adsorbent. The minimum point, at a pH of 3.2, resulted in the highest positive surface charge for the adsorbent. Hence, a pH of 3.2 was judged to be the best pH condition for removal of anionic substances using QPKS. The surface chemistry assessment is designed to distinguish between the surface acidity or basicity of an adsorbent. This information is especially vital for adsorption of charged particles. Oxygen-containing functional groups on adsorbents, such as carboxyl, phenol, and lactone, contribute to surface acidity, whereas Lewis basic functional groups that are proton donating, such as amine groups, contributed to the surface basicity. Increases in the ratio of surface acidity to basicity increase the affinity of the sorbent toward anionic substrates, and vice versa. 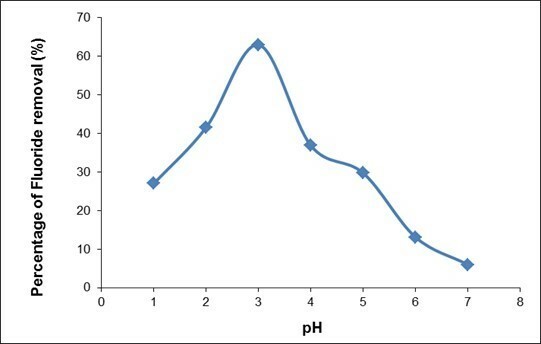 Boehm titration was conducted to test the surface basicity and acidity before and after the PKS surface treatment. The results of Boehm titration for PKS and QPKS are listed in Table 8. The surface total basicity of QPKS increased from 0.652 to 1.132 mmol/g after quaternization treatment. During the quaternization reaction, the NH4+ group reacting on QPKS resulted in an increase in surface total basicity in QPKS. Therefore, QPKS acquires a better affinity toward anionic substrates than does untreated PKS. Solution pH and ionic strength are the two most influential operational factors controlling the adsorption mechanism. The fluoride removal process is considerably affected by the pH of the sample solution. The effect of pH on the initial solution was investigated, ranging in pH from 1 to 7. The pH of the sample without pH adjustment was measured to be 7.2. 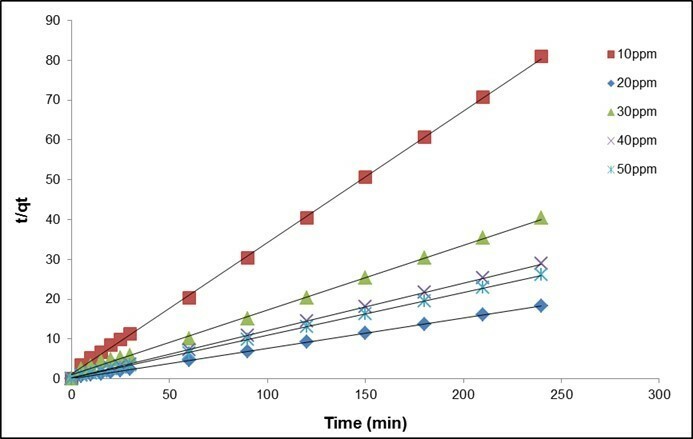 The initial concentration used was 5 mg/L, with an adsorbent dosage of 1 g/L for 1 h. Average results from 3 sets of batch experiments were taken for analysis part. As seen in Fig. 7, the percentage of fluoride removed decreased with increasing pH after a pH of 3. This is due to an increased OH– concentration, which competed with F– for adsorption. Adsorption is favored at a low pH because of the presence of more protonated sites in the ion exchange with F– (Nur et al. 2014). The actual pH where the fluoride adsorption starts to decrease depends on the surface chemical characteristics of the adsorbent (Loganathan et al. 2013). The optimum pH for QPKS was at pH 3, with 63% fluoride removal. Above the pHpzc (pH = 4.2), the adsorbent surface was negatively charged, retarding the diffusion of fluoride ions on the QPKS surface. The decrease in adsorption above the pHpzc was due to the repulsive interaction between anionic fluoride and the adsorbent surface. Similar results for fluoride ion adsorption on other adsorbents have been reported elsewhere (Hiemstra and Van Riemsdijk 2000; Tor et al. 2009; Nur et al. 2014). 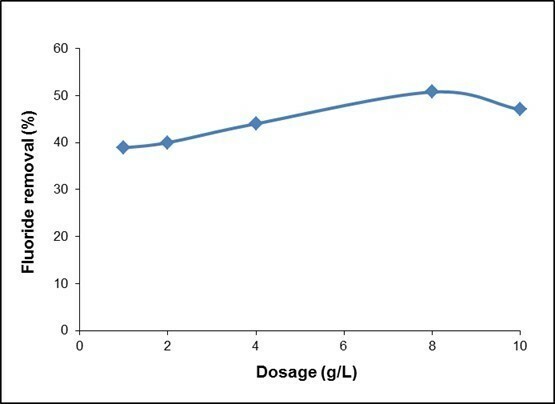 The effect of adsorbent dosage was investigated from 1 to 10 g/L at an optimum pH, as shown in Fig. 8. Fluoride removal increased with increasing dosage, and achieved equilibrium at a dose of 8 g/L. This increase in load capacity is due to the availability of a higher number of fluoride ions per unit mass of adsorbent, i.e., a higher fluoride/adsorbent ratio. However, further increases in adsorbent dose did not show any appreciable improvement in fluoride removal. This may be because of the very low equilibrium concentration of fluoride, i.e., the driving force responsible for adsorption became negligible (Kumar et al. 2012). Contact time studies are essential to explore the equilibration time in the adsorption process. The contact time studies for fluoride adsorption on QPKS at various initial fluoride concentrations are presented in Fig. 9. The adsorption curves in Fig. 9 are smooth and continuous. Initially, fast fluoride adsorption was observed in QPKS, confirming the chemical nature of the adsorption process; however, it eventually slowed down and attained equilibrium with time. The initial concentration was varied from 10 to 50 mg/L at an optimum pH and an adsorbent dosage, with a contact time of 4 h. The highest adsorption capacity which is the Qe was achieved with an initial concentration of 20 mg/L, which was close to 1.7 mg/g, with a 63% fluoride removal. This is probably due to the increase in the mass transfer driving force, resulting in a higher loading capacity for QPKS, as its active sites were occupied by a larger amount of fluoride ions. The adsorption process was rapid for the first 30 min, and equilibrium was achieved after 60 min. The increase in fluoride adsorption capacity on QPKS can be attributed to the formation of surface functional groups after quaternization, as the active sites caused an appreciable increase in adsorption. where Co and Ce (mg/L) are the initial and final concentrations of adsorbate in bulk solution, V (L) is the volume of the solution, and m (g) is the mass of the adsorbent. Four isotherm models, i.e., Langmuir, Freundlich, Sips, and Redlich-Peterson isotherms, were used to analyze the data. A non-linear method was chosen over a linear method to eliminate the inherent bias resulting from linearization. where qe is the amount of adsorbate adsorbed on each gram of adsorbent at equilibrium, Ce is the concentration of adsorbate in solution at equilibrium, and KL and αL are Langmuir constants. where qe is the amount of adsorbate per gram of adsorbent at equilibrium, Ce is a concentration of adsorbate in solution at equilibrium, and KF and nF are Freundlich constants. The Sips isotherm model (Eq. 4) is a blending of the Langmuir and Freundlich isotherm models; hence, it is more advanced in defining a heterogeneous surface. Unlike Langmuir and Freundlich isotherm models, the Sips isotherm model has three parameters, which are Ks, αs, and ns. At low concentrations, the Sips isotherm follows the Freundlich isotherm model, whereas at high concentrations, it follows the Langmuir isotherm model (Sips 1948). If 1/ns≪ 1, the surface of the adsorbent is heterogeneous, and when 1/ns≈ 1, the surface of the adsorbent is homogenous. where qe is amount of adsorbate per gram of adsorbent at equilibrium, Ce is a concentration of the adsorbate in solution at equilibrium, and Ks, αs, and ns are Sips constants. where qe is the amount of adsorbent per gram of adsorbent at equilibrium, Ce is a concentration of adsorbate in solution at equilibrium, and KR, αR, and β are Redlich-Peterson constants. The isotherm constant values with regression coefficients for all four models are listed in Table 9. The experimental adsorption capacity and the adsorption capacity predicted by isotherm models were compared, and the results are presented in Fig. 10. Table 9 shows comparisons of the four isotherms applied in this adsorption study. The amount of fluoride adsorbed per unit mass of QPKS (qe) was plotted against the concentration of fluoride remaining in solution (Ce). The Freundlich, Sips, and Redlich-Peterson (R2 = 0.9716) isotherms seemed to be better-fitting models than the Langmuir (R2 = 0.9241) isotherm. The use of a coefficient of determination of linear regression analysis for determining the best-fitting of the different linear isotherms was found not to be appropriate. Further analysis of the non-linear method was attempted. A computer operation application was developed to determine the isotherm parameters using an optimization routine to maximize the coefficient of determination between the experimental data and isotherms in the solver add in Microsoft Excel. Figure 10 shows that the Freundlich, Redlich–Peterson, and Sips isotherms overlapped, and seemed to be the best-fitting models with the same regression coefficient values (R2 = 0.9716). Unlike a linear analysis, different isotherm forms affected the value of R2, and impacted the final determination of parameters, where nonlinear methods would prevent such errors (Ho et al. 2002). The value of 1/nF in the Freundlich isotherm was 0.3982 (< 1), which indicated that chemisorption was more likely to take place in this adsorption. The degree of surface heterogeneity also appeared to be higher on the adsorbent. This led to a strong interaction between the adsorbate (fluoride) and the QPKS surface, thus creating ionic bonds. The value of 1/ns from Sips isotherm is less than 1 and further confirms adsorption on the surface of QPKS is heterogeneous. The value of Redlich–Peterson’s β value was 0.602, which meant the isotherms were approaching Freundlich’s but not Langmuir’s isotherm. It has been previously reported that Freundlich’s isotherm is a special case of Redlich–Peterson’s isotherm when constants KR and αR are much greater than unity (Ho 2004). Kinetics studies of adsorption help to understand the removal rate, mechanism of adsorption, and rate determination steps of the adsorption process. The pseudo-first kinetic and pseudo-second order kinetics models (Ho and McKay 1999) are the simplest kinetics models for describing any adsorption reaction. where k1 and k2 (min-1 and g /mg.min) are the pseudo-first and pseudo-second order rate constants, respectively, and qe1 and qe2 (mg/g) are the calculated values of the amount of adsorbent adsorbed per gram of adsorbent in an equilibrium state by the pseudo-first and pseudo-second order kinetics models, respectively. The qt (mg/g) is the amount of adsorbent adsorbed per gram of adsorbent during time, t. The qe (mg/g) is the experimental value of adsorbent adsorbed per gram of adsorbent. The results are shown in Table 10 and Fig. 11. The coefficient of determination, R2, for the pseudo second-order adsorption model had a high value (0.999) for all concentrations of fluoride in this study. Similar results were obtained by Liu et al. (2002) for the adsorption of fluoride onto ion-exchange fiber and by Fan et al. (2003) on low-cost materials. The Elovich equation has also been used to describe the adsorption process of pollutants from aqueous solutions (Cheung et al. 2001; Sag and Aktay 2002). It has been suggested that diffusion may account for the Elovich kinetic pattern, and conformation to this equation alone might be taken as evidence that the rate-determining step is a diffusion process in nature. 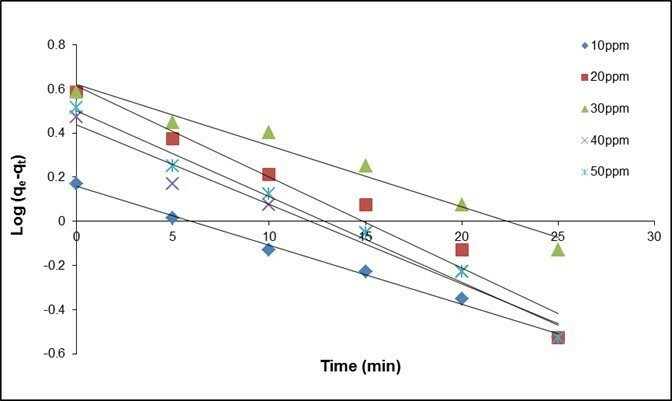 The kinetics curve of sorption demonstrated a good fit with the model (R2 > 0.97), which may indicate that diffusion rate-limiting is more prominent in fluoride sorption using QPKS at lower initial concentrations (10, 20, and 30 mg/L) (Fig. 12). The general explanation for this form of kinetics law involves a variation of the energetics of chemisorption with the active sites that are heterogeneous quaternized palm kernel shell (QPKS) fibers and therefore exhibit different activation energies for chemisorption (Ozacar and Sengil 2005) because the cell walls of QPKS mostly consist of cellulose, lignin, and hydroxyl groups. The Elovich model gives a good correlation for adsorption on highly heterogeneous surfaces and also shows that along with surface adsorption, chemisorption is an additionally occurring dominant phenomenon. However, in a highly heterogeneous system of surface adsorption, chemisorptions, ion exchange, precipitation, and intra-particle diffusion also occur concurrently. It was not possible to find which process was dominant. Elovich equation correlation coefficients were lower than those of the pseudo second-order equation. The Elovich equation does not predict any definite mechanism, but it is useful in describing adsorption on highly heterogeneous adsorbents. The adsorption system obeys the pseudo second-order kinetics model for the entire adsorption period and thus supports the assumption behind the model that the adsorption is due to chemisorption. These results imply that the chemisorption mechanism may play an important role in the adsorption of fluoride onto QPKS fibers. The adsorption of fluoride onto QPKS fibers most likely takes place via surface exchange reactions until the surface functional sites are fully occupied. After this, fluoride molecules diffuse into QPKS fiber pores for further interactions and/or reactions such as ion-exchange and complexation interactions (Ornek et al. 2007; Riahi et al. 2009). Thus, the adsorption of fluoride onto QPKS fibers is very well explained by the pseudo-second-order model. This result is consistent with other studies related to fluoride removal using adsorption (Chakrapani et al. 2010; Mohammad et al. 2013). where C is a coefficient accounting for the bonding effect between the layers; i.e., as the value of C increases, so does the boundary layer effect. ki is the rate constant of the process, mg g-1min-1/2. If the experimental data describe a multilinear dependence, this means that the sorption is influenced by two or more rate-determining steps, i.e., the process is occurring in the transition region. The intra-particle diffusion rates (ki) were determined from plots of qt versus t0.5. If intra-particle diffusion is a rate controlling step, then the plots should be linear and pass through the origin. 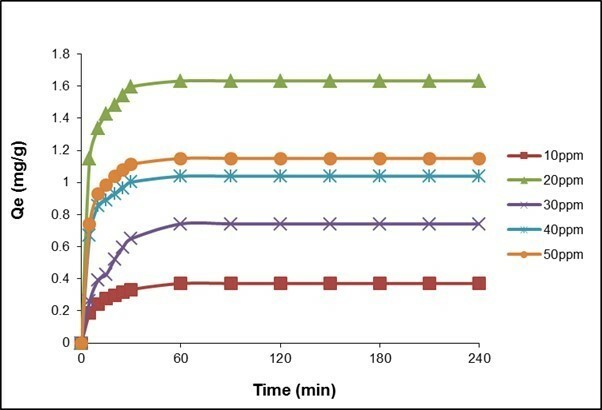 Figure 13 and Table 10 depict intraparticle diffusion as moderate, and the slope of the linear portion of the curve at each solute concentration gives the value of Ki. This result suggests that the adsorption is governed by diffusion within the pores of the adsorbent. The linear portions of the curves do not pass through the origin (Fig. 13), indicating that the mechanism for fluoride removal on QPKS may be complex, and both surface adsorption and intraparticle diffusion contribute to the absorption rate. Defluoridation using other adsorbents from previous study has been compared with this study. 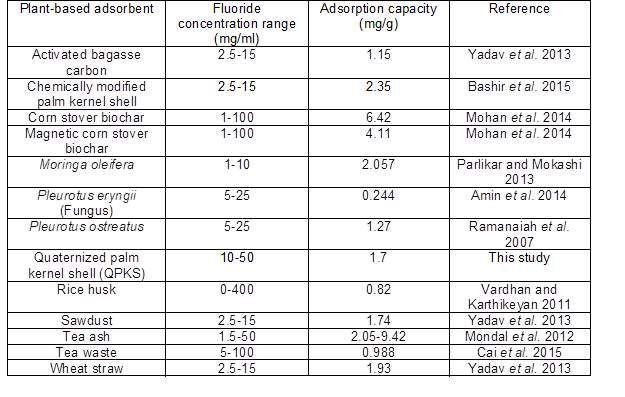 Table 11 shows the comparison between fluoride removal capacity with different fluoride initial concentration used using different plant-based adsorbents. Fluoride removal capacity from this study shows an acceptable value with other adsorbents. Table 11. 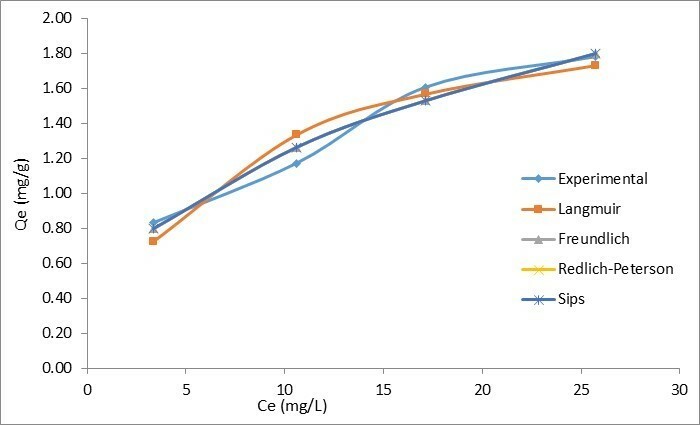 Comparison of Various Plant-based Adsorbents for Removal of Fluoride in Aqueous Solution (Bashir et al. 2015). The use of quaternized palm kernel shell (QPKS) as an alternative low-cost adsorbent has been shown to have very good potential for the removal of fluoride ions from aqueous solution. The adsorption process was influenced by parameters such as adsorbent dosage, initial concentration, and pH. Batch experiments demonstrated that the maximum fluoride removal by QPKS occurred at pH 3. The adsorption equilibrium data were fitted with Langmuir, Freundlich, Redlich-Peterson, and Sips isotherm models. The adsorption of fluoride was best represented by Freundlich, Redlich-Peterson, and Sips models, with an R2 value of 0.97. Kinetics data for adsorption of fluoride using QPKS tended to fit well in pseudo-second-order Lagergren kinetics models. The authors would like to acknowledge the financial support from the Research University Grant Scheme (RUGS) from Universiti Putra Malaysia Project no:05-02-12-2203RU and High Impact Research MoE Grant: UM.C/625/1/HIR/MoE/52 from the Ministry of Education Malaysia, RU022A-2014, for the success of this project. 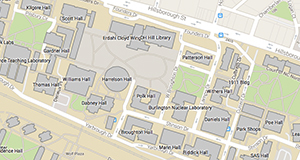 Bashir, M., Salmiaton, A., Nourouzi, M., Azni, I., and Harun, R. (2015). “Fluoride removal by chemical modification of palm kernel shell-based adsorbent: A novel agricultural waste utilization approach,” Asian J. of Microbial. Biotech. Env. Sc. 17(3), 533-542. Lagergren, S. (1898). “About the theory of so-called adsorption of soluble substances,” K. Svenska Vetenskapsakad. Handl. 24(4), 1-39. MPOB (2012b). Oil Palm Production and Stock, (http://www.mpoc.org.my/monthly_sub_page.aspx?id=435a0389-5300-4264-8e5f-e023ce9d8780). Pavia, D. V., Lampman, G. M., Kriz, G. S., and Vyvyan, J. R. (2009). “Introduction to spectroscopy”, Fourth Edition. United State of America: BROOKS COLE Publishing Company. Sips, R. (1948). “Combined form of Langmuir and Freundlich equations,” J. Chem. Phys. 16, 490-495. Vardhan, C. and Karthikeyan, J. (2011). “Removal of fluoride from water using low-cost materials,” Fifteenth International Water Technology Conference, IWTC-15. Weber, W., and Morris, J. (1963). “Kinetics of adsorption on car­bon from solution,” J. Sanitary Eng. Div. ASCE 89(2), 31-60.
WHO (1984). “Guidelines for drinking water quality,” in: Health Criteria and Other Supporting Information, World Health Organization, Geneva, Switzerland. Xu, X., Gao, B. Y., Yue, Q. Y., and Zhong, Q. Q. (2010). “Preparation and utilization of wheat straw bearing amine groups for the sorption of acid and reactive dyes from aqueous solutions,” J. Hazard. Mater. 182(1-3), 1-9. Zeldowitsch, J. (1934) “Uber den mechanismus der katalytischen oxydation von CO an MnO2,” Acta Physicochem. URSS 1(2), 364-449. Article submitted: October 26, 2015; Peer review completed: November 22, 2105; Revised version received: March 7, 2016; Accepted: March 19, 2016; Published: April 4, 2016.